I started kayaking when I was 10 years old. I learned a lot about this sport training for junior slalom world championship. I began to understand what 'working hard for a dream' means and how incredible can be when you get closer to it. At 18 years old I decided to study Physics at university and I had to stop slalom racing. However, inside myself, I had always felt the needing of adrenaline and challenges. To feed this hunger I began to live the river in a different and wonderful way: with my creek kayak. I started to travel around the world running all sort of rivers surrounded by all kinds of landscapes. Since I was 18 I used all the time left to earn some money to live experiences in some rivers lost in the middle of nowhere. I've paddled in Africa, South and North America, all Europe and I still feel there are so many places I'd like to discover... I still feel like a child who want to discover the world. Running a river is for me a wonderful and unique way to get in contact with nature, that you can't reach in any other way. In the river you can feel the power of nature...feeling part of it. I love the challenges, first with yourself, you have to face in front of a difficult rapid or a big waterfall. All my mind is concentrate in dominating the fear and focuses on the right line to take. When I finally get to the bottom of the drop and I look backward I can feel pure happiness. River life allowed me to know a lot of myself, as well as many different people who share with me this passion and lifestyle. My best memories have a river as background. Beside this aspect of living the river, I never lost my attention on the kayak technique. Whitewater extreme kayaking is a relatively new sport and there are so many things to discover and improve. The kayak itself changed a lot in the last 10 years, allowing new moves and new drops. How is the better way to move in different situations and how many things modern kayaks can do are the questions I'm trying to answer training everyday focusing on any little detail of my style. 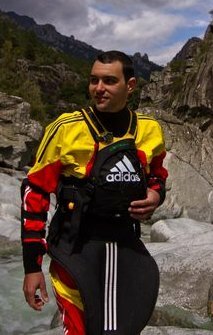 Racing in extreme rapids is very important for me. It feeds my hunger of challenges like running big drops. In races I need to do my best, use all my concentration and strength. There are not many other ways for me where I can feel to use all my resources, physical and mental, to reach an aim. Moreover, international races have become the place where I can find all my friends and enjoy paddling with them.